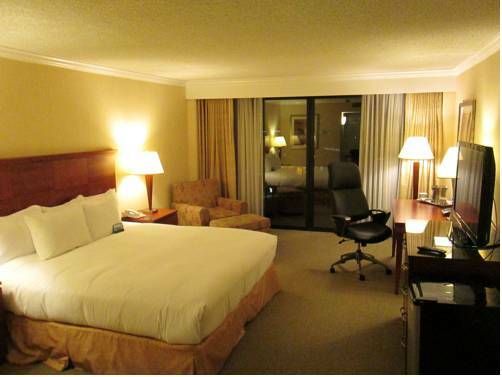 The Ontario Airport Hotel and Conference Center is centrally located in the Inland Empire of Southern California 2.4 miles away from the Ontario International Airport and the Ontario Convention Center. This convenient location is also accessible via major highways to the surrounding areas of Claremont Pomona Riverside Temecula San Bernardino Palm Springs Anaheim and Los Angeles. Comfort and relaxation are yours when traveling for business or leisure with our 309 beautifully appointed guest rooms and suites with 24000 square feet of flexible meeting and function space to accommodate groups up to 750 attendees. Our hotel onsite restaurant Blu Bar and Grill seats 120 guests and features delicious classic American cuisine along with daily happy hour specials. Enjoy a beverage with your friends or a client in our relaxing lounge or out by our heated outdoor pool and patio or in the privacy of your own room with our nightly in room dining service. Visit our Cyber Cafe located in our atrium serving Starbucks coffee in the morning along with our fresh pastries or snacks to go. Adventure to our local area with Citizens Business Bank Arena with weekday and weekend entertainment concerts or major sporting events along with nationwide motorsports at Auto Club Speedway featuring NASCAR and INDYCAR all less than 8 miles from the hotel in addition to San Manuel Amphitheater just 15 miles north of the hotel featuring a large outdoor concert venue. Enjoy a short evening stroll that will take to you to restaurant row with several major chain restaurants one block away from the hotel for additional nearby options So many options to enjoy at our convenient Southern California location to work or play. City Location near Ontario International Airport. Auto Club SpeedwayThe Auto Club Speedway hosts the NASCAR sprint series and IndyCar Championship speed races. Big Bear Mountain ResortsBig Bear Mountain Resorts present Big Bear Lake and watersports Snow Skiing Camping Fishing and Lake Arrowhead. Citizens Business Bank ArenaCitizen Bank Arena located 2 miles east of the hotel presents concerts sports and celebrity entertainment. Glen Helen SpeedwayGlen Helen Raceway presents National Motorcross competitions and events. Ontario Convention CenterThe Ontario Convention Center presents 225.000 Square meter of convention space for the Ontario Area. Ontario Mills MallOntario Mills Mall is one of Californias Largest Outlet Shopping Destination with over 200 outle and value stores. San Manuel AmpitheaterSan Manuel Amphitheater presents outdoor concerts and festivals located 14 miles North East of the Hotel. Temecula Valley Wine CountryTemecula Valley Wine Country presents year round festivals wine tours and season Hot Air Balloon festivals with charming old town Temecula with daily events. Victoria GardensVictoria Gardens presents a pedestrian-oriented open-air mixed-use town center in Rancho Cucamonga with Bass Pro Shop.